While looking straight ahead, draw your shoulders upward (without lifting your arms). Hold for 5 secs and relax. Repeat this several times. You should avoid any exercise which causes you to have increasing pain or other symptoms. Consult with a medical professional before beginning any exercise program. The information provided on this website does not provide or should be considered medical advice. It is not a substitute for diagnosis or treatment of any condition. The information provided is for informational purposes only. You should not rely solely on the information provided on this website in making a decision to pursue a specific treatment or advice. You should consult directly with a professional healthcare provider. 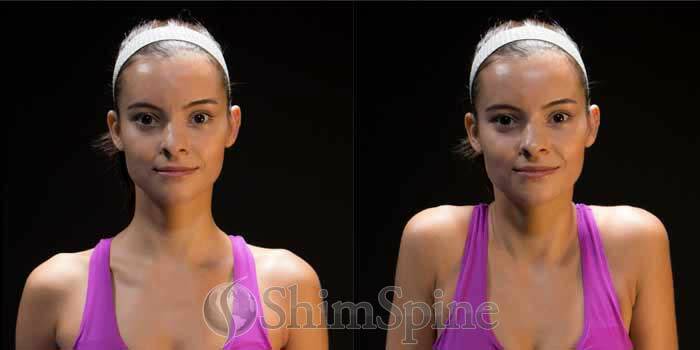 As a condition of using the information on this website, ShimSpine and its physicians are not responsible for any advice, diagnosis, treatment or outcome you may obtain. ShimSpine.com is completely self-funded. No outside funds are accepted or used. This website does not utilize paid advertising as a source of revenue. © 2019 ShimSpine.com. All rights reserved.